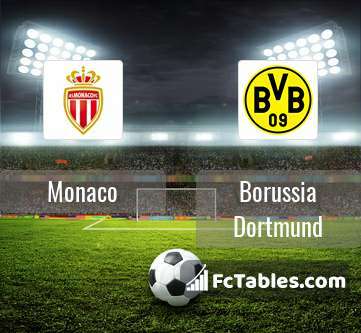 Kick off Monaco-Borussia Dortmund in Champions League on today 20:00. Referee in the match will be Craig Pawson. Team Monaco currently is on lower place in table (4 position). Monaco in 5 last matches (league + cup) have collected1 points. The best players Monaco in Champions League, who scored the most goals for the club: Samuel Grandsir 1 goals, Moussa Sylla 1 goals. Players with the most assists: , Aleksandr Golovin 1 assists. Injured players Monaco: Danijel Subasic, Jean Aholou, Kevin N'Doram, Marcos Lopes, Stevan Jovetic, Adama Traore, Djibril Sidibe, Jordi Mboula, Pietro Pellegri, Samuel Grandsir, Almamy Toure. Team Borussia Dortmund is located in the middle of the table. (2 place). Last 5 games (league + cup) finished balance 10 points. Borussia Dortmund did not win the match from 2 games. The most goals in Champions League for Borussia Dortmund scored: Raphael Guerreiro 2 goals, Marco Reus 1 goals, Jacob Bruun Larsen 1 goals. Most goals developed: , Marco Reus 1 assists, Jacob Bruun Larsen 1 assists. In Borussia Dortmund not occur in the match due to injury: Thomas Delaney, Marco Reus, Lukasz Piszczek, Jacob Bruun Larsen. 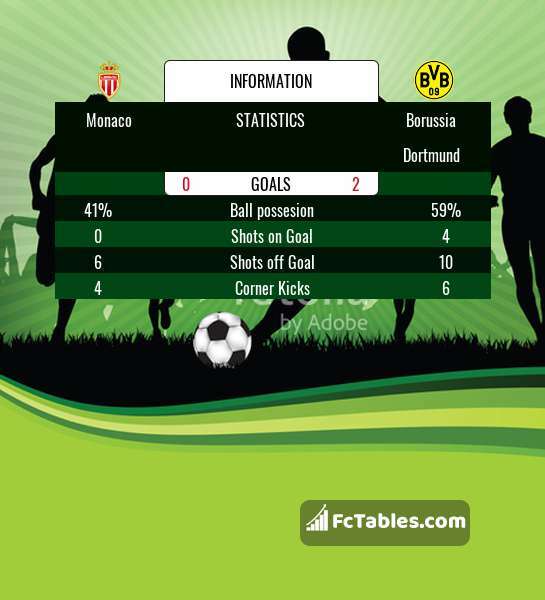 Direct matches: Monaco won more direct matches. Monaco won 2 matches , Borussia Dortmund won 1 direct matches, was a 0 draws. In 3 matches the sum of the goals both teams was greater than 2.5 (Over 2.5), and 3 matches teams scored more than 1.5 goals (Over 1.5). In 2 matches the both teams scored a least one goal (Both teams to score).